But how did these compare to the original Ferris wheel that was built on the Midway at the World’s Columbian Exposition of1893? That crowd pleaser was designed by a Pittsburg engineer named George Ferris. Believe it or not, the original wheel was a whopping 250 feet tall. One of the goals was to produce an attraction in Chicago that was bigger (and better?) than the Eiffel Tower build for the last world exposition in Paris. It had 36 wooden cars that held 60 people. Each 5 cent ride was two revolutions. The Ferris wheel proved to be a very successful money maker for the Fair. This entry was posted in Uncategorized on February 2, 2016 by bturner0627. Whenever I give walking tours in Bronzeville, I like to point out not only the landmarks, which are plentiful in this historic neighborhood, but also the newer local sites that will continue to draw tourists. At the corner of 35th and State there are two six-feet and 4,000 pound obelisks that were installed in November, 2009. The obelisks (Greek for a tall four-sided stone pillar that taper to a pyramidal top) were the created from an idea of the late Senator Margaret Smith and Esther Barnett, a local merchant. The Bronzeville Merchants Association, the State of Illinois and the City of Chicago are responsible for these interesting works of art. 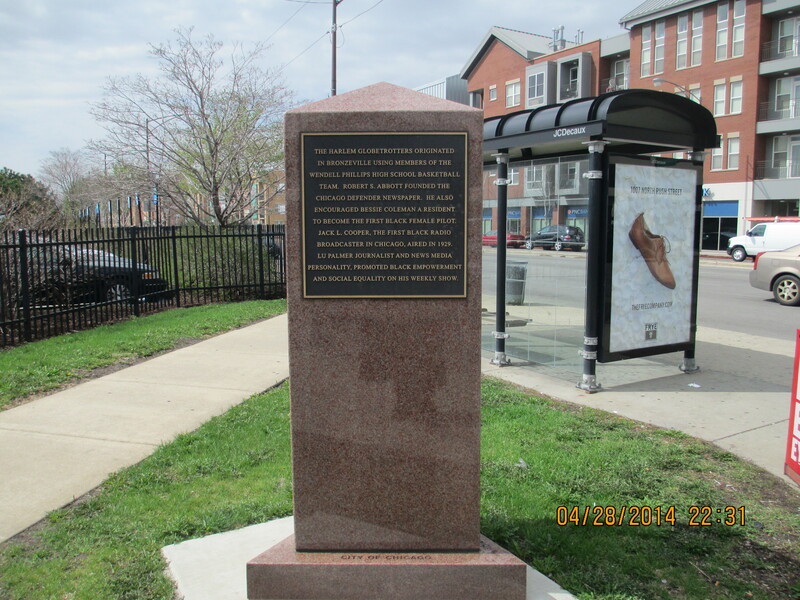 The obelisk south of 35th Street honors the first non-native settler of Chicago, Jean Baptiste Point DuSable. Many people don’t that many African Americans settled in Chicago as it became a city after 1837. A panel honoring Dr. Daniel Hale Williams is also here, telling the story of Provident Hospital in Bronzeville where the first open heart surgery was performed. Also mentioned are all of the types of businesses that flourished and the “stroll” area where people walked and shopped and interacted. If you visit the landmark Chicago Bee and Douglas Bank Building two blocks south at 36th and State you can see the mural inside of the entrance to what is now the Bee Branch of the Chicago Public Library. The mural depicts the State Street area and the “stroll”. 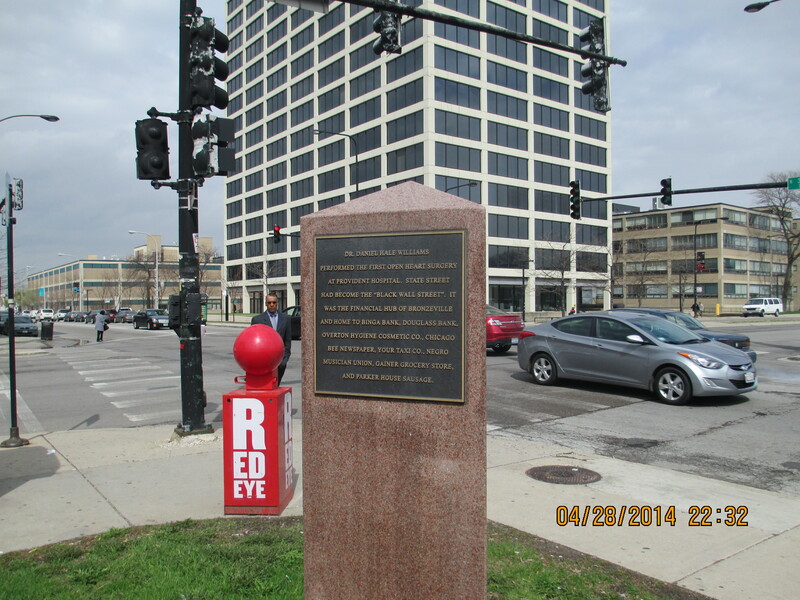 The other obelisk is located north of 35th Street closer to the campus of IIT (Illinois Institute of Technology. 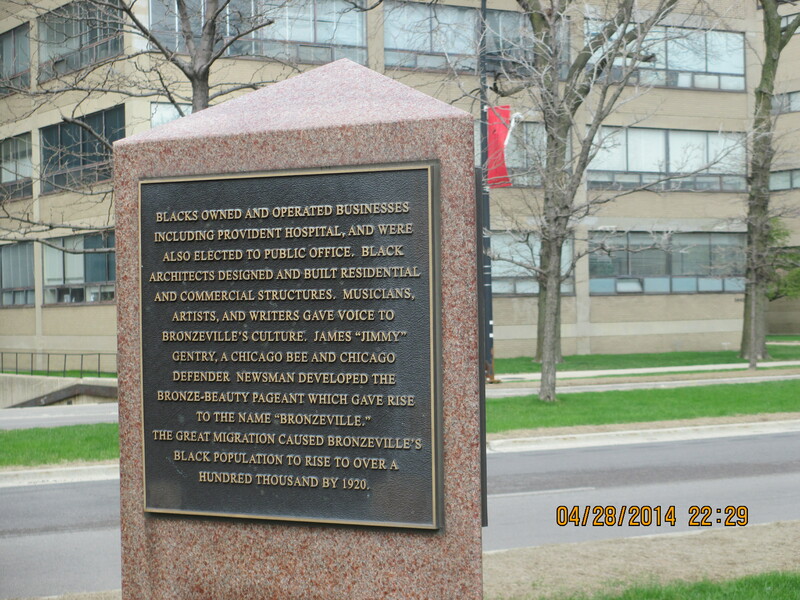 It tells the story of Bronzeville as a city within a city, complete with its own shops and entertainment. This is because of the racially restrictive covenants that prevented blacks from purchasing or renting homes outside of the “Black Belt”. The area was busy with people and commerce, theaters and clubs for entertainment. Each of the obelisks has hieroglyphics on them. Every time I visit with tour guests someone asks about the hieroglyphic symbols. I always have to say I don’t know what they symbolize, but now I’m on a quest for knowledge. Can you find out what they mean? What other obelisks do you know and where are they located? This entry was posted in Uncategorized on May 21, 2015 by bturner0627. 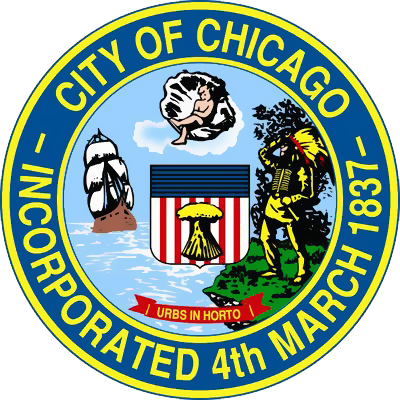 The seal of Chicago and the municipal device are the other Chicago symbols besides the Chicago flag. The seal was adopted when Chicago became a city by declaration of the State of Illinois on March 4, 1837. 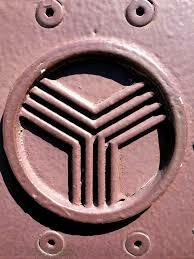 The seal has several images, including the shield in the center with a sheath of wheat, which symbolizes fertility. The ship represents Lake Michigan while the Indian is the original settler of the area. Then there’s the sleeping infant. What do you suppose it represents? Some people say he represents innocence and purity. The red scroll has the words: urbs in horto. That’s Latin for city in a garden. Why do you suppose that motto was used for our city? The municipal device is used in various ways unofficially around the city such as in architecture. Can you find some places where the municipal device is used in the city? One such place is in the marquis of the Chicago Theater. This design was created in 1892 for a contest by the Chicago Tribune and was included along with the flag and the seal as symbols of Chicago by city council in 1917. The municipal device represents the three branches of the Chicago River. How do Chicago’s symbols compare with other symbols of cities in Illinois? In other American cities? In cities internationally? This entry was posted in Uncategorized on April 3, 2015 by bturner0627. The Battle of Fort Dearborn of 1812. The Fort was built in 1803 here in what was called the Northwest Territory to lay claim to the area for the United States. Soldiers and settlers at Fort Dearborn tried to defend the Fort from Indian attack, but were overcome by the attack and had to flee. The Fort was later rebuilt and more settlers came to the area that would become Chicago in 1837. The Great Chicago Fire of 1871. The summer of 1871 was very dry from drought and there were other conditions such as wood frame houses that made Chicago susceptible to the ravages of fire that burned for three days and destroyed most of the city. World’s Columbian Exposition of 1893. In 1893 Chicago held a world’s fair to commemorate the arrival of Columbus in the New World and to show how great Chicago had become and how it grew after the devastating Fire. Millions of people came to Chicago to see all the attractions. Century of Progress World’s Fair of 1933-34. Chicago hosted another very successful fair commemorating the hundred years since Chicago was incorporated. It was held on the lakefront near where the Museum Campus and Soldier Field are located. Also part of the flag are the two blue stripes that symbolize the north and south branches of the Chicago River. The three remaining white stripes are for the three sides of the city: north, south, and west sides. This entry was posted in Uncategorized on March 23, 2015 by bturner0627. Chicago became a city in 1837 when the legislature of Illinois approved its incorporation. Originally, the charter for the city established that the mayor would be elected by popular vote. It also established a Common Council, which later became what we now call the city council. The city charter established rules for electing the mayor and the city council, which consisted of 35 wards or geographical areas and 70 aldermen. In 1923, the city was reorganized into 50 wards with the same number of aldermen. It is important to note that Chicago elections are non-partisan. That means that the officials are elected by popular vote regardless of the political party of the candidate. The winner has to receive a 50% majority of the votes plus one. If this is not achieved, there is a runoff election in April. In addition to the mayor and aldermen, the election also includes voting for the city clerk and city treasurer. Unlike many cities, Chicago does not elect the school board. They are appointed by the mayor. In this current election of 2015, there is a question on the ballot about whether the school board should be elected. The mayor has the power and the duty to appoint department heads such as the chief of police and the fire chief. The city council approves these appointments and makes decisions about how money is spent for services for the citizens of Chicago. Why is it important to have a government? What might happen if we did not have government? Why do you think the elections in Chicago are non-partisan? Why is that good or bad for the city? Do you think that the school board should be elected or appointed? Why? If you could vote for mayor of Chicago, who would you vote for and why? This entry was posted in Uncategorized on February 23, 2015 by bturner0627. On February 19, 2015, the Pullman State Historic district will be declared a National Monument by President Barack Obama. This historic neighborhood began as a company town, created by the industrialist entrepreneur, George M. Pullman. Pullman was born in 1831 in Brockton, NY but moved to Albion, just east of Buffalo to assist in the carpentry business. Out of that business working on expanding the Erie Canal, Pullman’s father, Lewis, developed a method of moving and raising buildings. George took over that business and contracted with the State of New York to raise some twenty buildings so that the Canal could be widened. In the late 1850s Pullman came to Chicago to help with the raising of buildings here. Because of severe flooding and problems with mud, many buildings needed to be raised and a sewer system installed for Chicago’s growth and prosperity. Pullman joined forces with other engineers to further this work. Pullman’s next project was to convert railroad cars with seats into luxurious sleeping cars for the expanding railroad business, of which Chicago was a major hub. The Palace Car Company was charted in 1867 by Pullman and during the next two decades became the leading producer of sleeping cars. In addition to expanding the business, George Pullman also built a town for the workers, which included housing, a school, a church, a hotel, Hotel Florence, and other amenities making it a self-contained community, Pullman, IL in 1881. People who travelled in the sleeping cars had to first purchase a ticket from the railroad and a separate ticket for overnight travel in the well-appointed cars. They were attended to by a legion of porters, who were African American, many of whom migrated from the south during the Great Migration. They had to attend to the sleeping berths, handle luggage and provide assistance to the passengers night and day. They were required to work 400 hours per month or 11,000 miles. 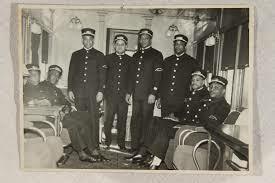 They were finally able to form the Brotherhood of Sleeping Car Porters in 1925, becoming the first African-American labor union. Although Pullman’s town and industry were apart from the city, they were influenced by the labor unrest that began in the 1880s. Chicago industries were notorious for demanding long hours and providing poor working conditions. There was much unrest and protest to get an eight hour day and better working conditions that came to a climax in the Haymarket riots of 1886. This unrest and demand for better conditions reached Pullman during the recession of 1893-94. Pullman showed that his relationship with his employees was not so benevolent when he lowered the salaries of the workers while not lowering the rents that they had to pay for their lodging or even the prices for goods at the company store. This caused a strike by the workers who were aided by other railway workers’ unions. Eventually, President Grover Cleveland called in federal troops to stop the rioting. The strike was broken, but Pullman’s reputation was tarnished. In addition, the Illinois Supreme Court ruled that the town could not exist as a company town in 1898 and Pullman was forced to sell off the homes that were formally annexed into Chicago as did many other townships, in 1889. What conditions let up to the labor riots in the 1880s and 1890s? How could the conditions have been changed? Why were the laborers so angry in Chicago and in Pullman? George Pullman was an entrepreneur and a forward thinker. What evidence can you find that there were contradictions in his actions? What were the advantages and disadvantages of creating a company town? What other places had company towns? How were they the same and how were they different? What role did the Pullman cars play in the Great Migration? What is the difference between a national monument and a national historic site? This entry was posted in Uncategorized on February 15, 2015 by bturner0627. Prior to 1909 the present street numbering system was very haphazard and based on the divisions of the city as defined by the Chicago River and the lake shore. The current numbering system was devised by Edward P. Brennan and adopted by the City Council in 1909. The basis of the numbering system was to divide numbers North and South from Madison Street and those East and West from State Street. The changes in the numbering system were implemented in two phases: most addresses outside of the central district were changed in September, 1909, and changes in the central business district took place in April, 1911. The homeowners had to inform the businesses with which they corresponded of the changes so they sent out postcards. Some of these postcards were humorous and suggested that the “powers that be” saw fit to change the numbering system. However, everyone who had ever tried to get around early Chicago would agree that the new numbering system was very helpful. Because although the 1830 Thompson plat system in place, the numbers ran differently in the three divisions of the city. One of the other important issues that Brennan championed was the elimination of duplicate street names and resulted in the changing of street names for the sake of consistency. The current practice of giving honorary street names for people who have made a contribution to the city is a way of maintaining the consistency of street names. What is the difference between the designation of street or avenue? Is there any consistency? What are some of the street names that have been changed over the years? How does the city council determine the names of the streets? Who are some of the people who have honorary street names? How can you tell how far you have traveled based on the street numbers? This entry was posted in Uncategorized on February 5, 2015 by bturner0627.